Rotterdam is the second largest city in the Netherlands. About 650,000 people live there. In the urban area, there are about 1.1 million people. Rotterdam also has one of the biggest ports in the world. It is the biggest port in Europe. The city is on several rivers, most notably the Maas. Rotterdam, like all of the Netherlands, has an oceanic climate (Cfb in the Koeppen climate classification). It hosts also a university: the Erasmus University Rotterdam. A dam was built in 1260 across the river Rotte where the Hoogstraat is now. The name Rotterdam comes from this dam. The settlement was a regular fishing village at first, but became a thriving trading port pretty soon. The city got city rights in 1340 and city walls in 1360. Rotterdam became an important city in Holland in the middle of the 15th century when it won little wars against Delft and Gouda. From 1449 until 1525 a Gothic church (Laurenskerk) was built. The city then hold about 10,000 people. The city revolted against Spanish occupation in 1573, becoming one of the main city's of the Eighty Years' War. The port of Rotterdam grew a lot in the late 16th century and early 17th century. In the end of the 17th century the city hold almost 50,000 people. But the city had not built outside of the city walls. The city became very crowded. Nazi Germany attacked the Netherlands in May 1940. The Battle of the Netherlands brought heavy fighting in Rotterdam. In the Blitz of Rotterdam, the Germans bombarded Rotterdam on May 14, 1940. 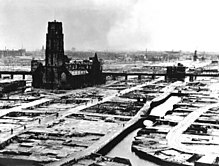 The damage was huge; 24,000 buildings were destroyed in only 15 minutes, and there was virtually nothing left of the old centre of Rotterdam. 800 people died instantly, and 80,000 were homeless. The bombardment also destroyed the Willemsbrigde, one of the two brigdes across the Maas at that time. The Germans repaired the bridge quickly, as it was of vital importance for the city. During the German occupation, the neighbouring places of Hillegersberg, Schiebroek, Overschie, Kralingseveer and Ijsselmonde are annexed (put by) by Rotterdam. On November 11th, 1944, a large razzia took place. About 50,000 men from 17–40 years old from Rotterdam were deported into working camps. The city also lost many people in the famine of 1944 (hongerwinter (lit: Winter of hunger)). ↑ "College van b en w" [Board of mayor and aldermen] (in Dutch). Gemeente Rotterdam. Retrieved 10 December 2014. ↑ "winosandfoodies: 15 entries from July 2010". winosandfoodies.com. Retrieved 19 December 2010. Wikimedia Commons has media related to Rotterdam. This page was last changed on 2 April 2019, at 18:09.